Why Can't 911 Find You When You Call From a Cell Phone? Why Can’t 911 Find You When You Call From a Cell Phone? Last week, I participated in a news story about 911 and why first responders sometimes have a hard time locating people who call from cell phones. This is a very important topic and in an emergency, seconds count. So, what can you do to make sure you are found? Why doesn’t 911 get my exact location from my phone’s GPS? First, we need to understand how the system works. When you call 911, you are making a voice call that is transmitted from your cell phone to the nearest towers and then those towers transmit your call to the nearest 911 call center. A common misconception is that your exact location is sent along with that call. The confusion happens because we are used to seeing TV shows and movies where first responders can see exactly where the caller is, instantly, when they call 911. This is not how it works in real life, and it is depicted this way, like many other things, for dramatic effect. We are also used to apps and programs on our cell phones showing our exact locations (think Google Maps, Uber, etc) and we don’t realize that voice calls DO NOT work the same way as apps running on your device. When your call comes into the 911 call centers, they can see the locations of the cell phone towers nearest to your location. They can ping the towers, or contact the cell phone companies, to request GPS coordinates of your location. When and if that information is available, it still only narrows the possible area of your location at best. Right now this more specific location data is only available around 20% of the time. If the GPS coordinate information is available, there are a variety of factors that will impact the accuracy of that location. Are you indoors our outside? Are you in the middle of a flat field, a wooded terrain, or inside a building in a densely populated area? When seconds count, in the midst of an emergency, relying on location data is usually NOT the most efficient way to locate you. So how can I help 911 find me? Be aware of your surroundings. When you are driving, read signs along the road. If you are in an accident and you don’t know where you are, take a look at the maps app on your phone and zoom in to see the nearest cross street. This information will be valuable in getting help to you! What direction are you travelling? What landmarks can you see? Can you see any road signs or mile markers? When I was younger and just learning to drive, my dad gave me the advice to always be aware of my surroundings, where I am. It is second nature to me now to do this whenever I am behind the wheel. Set up and use your iPhone’s Emergency SOS feature. Visit Apple’s website to learn how to set up and Use Emergency SOS on your iPhone. This built-in feature lets you set up special contacts to receive an SOS text message, including your location, when you tap the sleep/wake button 5 times in quick succession. You can also turn on emergency calling, which will initiate a 911 call at the same time. NOTE: the 911 center DOES NOT receive the text message with your location, your emergency contacts do. Also, please do not test this feature to see if it works… keep 911 lines clear for actual emergency calls. Just set it up. It works! YOU are your best advocate in an emergency. When you call 911, be prepared to help them find you by being aware of your surroundings, and don’t rely on your cell phone to pinpoint your location in an emergency. 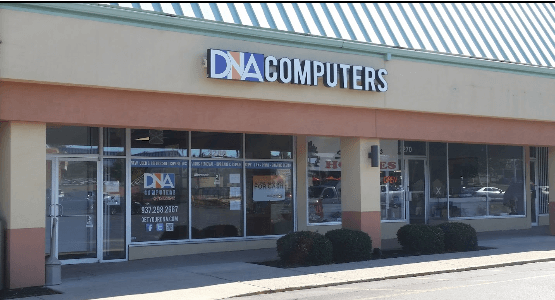 At DNA Computers in Kettering, we are constantly learning about and exploring the technology that surrounds us in our daily lives. Technology can improve and enhance our lives, but has limitations. We hope that this important information can help you be better prepared in the case of an emergency. Keep an eye out for WHIO Special Reports on this topic.